On December 29, 1912 The New York Times printed a charming sketch of Fourth Avenue (later renamed Park Avenue South) at around the time of the Civil War. A coach headed north on the nearly-empty street and dormered houses lined the block. Unseen in the drawing, of course, was Gramercy Park, the elegant mansion-lined enclave a block to the east developed in the late 1840s. The purpose of the sketch was to illustrate the radical changes to the avenue. Residences were being eradicated and replaced by soaring commercial buildings. “In the business section of Fourth Avenue, from the Everett Building at Seventeenth Street to Thirty-fourth Street, there are only four entire block fronts which have not yet been invaded by modern improvements,” noted the newspaper. Although the purchase agreement delayed possession of the property until December 1, the brothers wasted no time in choosing their architect and laying plans. 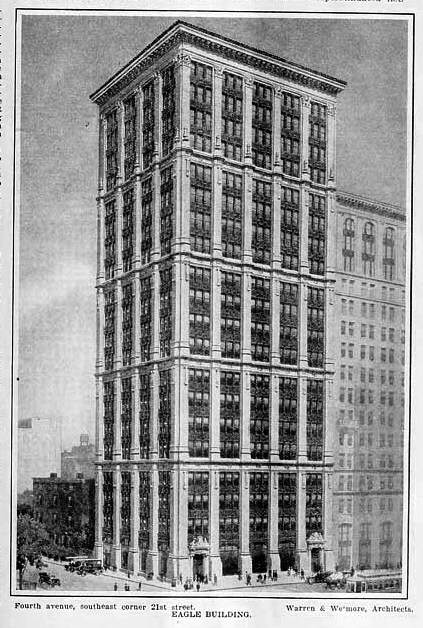 In November 1911 Warren & Wetmore filed plans for what would be known as the Eagle Building. In addition to their signature Grand Central Terminal still rising 20 blocks north on the avenue, the firm was simultaneously busy with two other depots, Union Station in Manitoba, Canada and Union Station in Houston; as well as the Condado Vanderbilt Hotel in Puerto Rico. And because the 20-story building sat directly behind the low mansion of Gramercy Park West, tenants were assured of sunlight on three sides. This fact, along with amenities like the four “high speed” passenger elevators, three large freight elevators, the lobby, and the especially high ceilings (the Record and Guide noted that “all the ceilings are of unusual height for buildings of this character”), resulted in a highly-marketable structure. Handsome terra cotta panels are ornamented with Renaissance pediments and exquisite shells. A few months into construction the first lease was signed. Franz Merz rented “for a long term of years” the entire second floor and part of the third. His total lease amount was $150,000—more than $3.5 million in 2015. This success, coupled with the full tenant list in the Eagle Building, made John H. and Charles K. Eagle extremely wealthy men. And they followed the pursuits expected of Edwardian millionaires. In 1913 John H. Eagle embarked on a big-game safari to Africa. A popular adventure at the time, it which would be brutally criticized today. Heavy ornaments along the cornices at every fourth floor relieve the mass of the large structure. In June 1925 the Eagle brothers sold their building, deemed at the time by The New York Times as “one of the finest buildings in the section.” They had no intention of leaving, however. Simultaneously they negotiated a lease with the new owner, Frederick Brown, for retail and second floors, as well as the basement. But J. H. & C. K. Eagle remained only four more years. On December 23, 1929 The Times reported that Rex Cole, Inc. had taken the showroom and second floor for ten years. The refrigerator distributor got more than simply two floors. “The structure is to be renamed the Rex Cole Building after the lessee’s removal from 551 Fifth Avenue next month,” announced the newspaper. But Maranzano’s suite of offices had little to do with real estate transactions. He was a gangland boss who, in September 1931, had the uneasy suspicion that some of his underlings were plotting a coup. He decided to make the first move. Maranzano hired hit-man Vincent “Mad Dog” Coll to take out the mutinous conspirators. But before the plan played out, one of the men, Charles “Lucky” Luciano was tipped off. On September 10, 1931 the mob power play would come to a violent end on the 9th floor of the Eagle Building. In searching the stairways, detectives found on the sixth floor landing three cartridges from a .38 calibre pistol which the killers had fired at their pursuers. On the second floor they found another pistol, fully loaded. Next to Maranzano’s body was the stiletto that had been used to stab him. By mid century the vast showroom space at ground level had been broken up into several stores. From one of them Bernard Loeb operated his delicatessen. The location was convenient, since he lived around the corner at No. 8 Gramercy Park. Around 10:30 on the night of July 18, 1953, the 63-year old proprietor was alone in the deli when two gunmen entered and demanded money. Loeb handed over what cash he had—less than $200—and the robbers fled. Highly agitated, he telephone police. Two radio cars responded and Loeb was able to give descriptions—“in their late twenties, wearing sports shirts and slacks.” The police left to search the neighborhood. When they returned after only a few minutes, they found Bernard Loeb dead. The excitement had brought on a fatal heart attack. One highly-ornate entrance was transformed into a window. Today Warren & Wetmore’s handsome Eagle Building is little changed above the ground floor’s modern store fronts. While the lobby entrance has been modernized, the striking metal revolving door enclosure at the north end survives; carefully converted to a show window.